Chimborazo and Cotopaxi are challenging and beautiful mountains, but technically not too difficult. The Ecuador volcanoes expedition is done "alpine-style" with all the climbs done out of comfortable mountain huts instead of tents. A great mountaineering trip for those with high altitude climbing goals and who want to put their abilities to the test in a beautiful location. A great introduction into high-altitude international climbing, the Ecuador volcanoes climbs offers some of the best volcano climbing in the world inlcuding Chimborazo, the highest volcano in the world. On the Chimborazo and Cotopaxi climbs you also have the opportunity to experience the rich Ecuadorian culture while gaining high altitude mountaineering climbing experience. Join us on one of our favorite South American climbing expeditions. 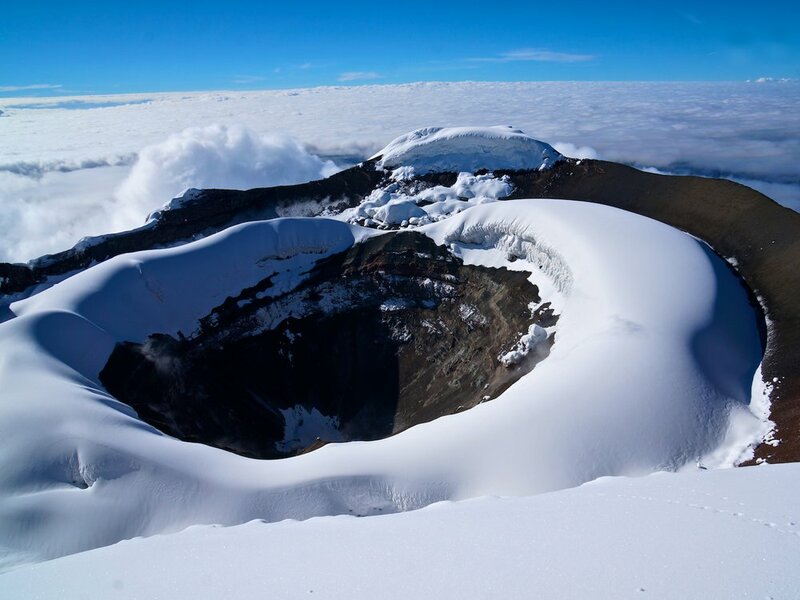 Climbing the Ecuador volcanoes with a highly experienced American mountain guide is a perfect high altitude climbing trip for those who just want an introduction of high altitude climbing or for those with even larger mountains in mind. Large glaciers and big views await. We begin in the capitol city of Quito and climb a smaller local peak for acclimating before moving on to Cotopaxi. Cotopaxi is one of the most beautiful mountains in the world and much sought after by mountaineers around the world. Then it's on to the big one - Chimborazo. The climb of Chimborazo is a long one, strenuous but not too technically challenging. While standing on the summit of Chimborazo you are rewarding with knowing you are standing on the furthest point from the center of the world! Success on the Chimborazo & Cotopaxi climbs requires basic ice axe and crampon skills and a very good fitness level. Early in the trip, your American mountain guides will review with you the glacier skills necessary to the magnificent Ecuador volcanoes. We build flexibility into our itinerary in case of inclement weather or other unforeseen delays. We go with small group sizes, no more than six total, for more personal attention and flexibility. 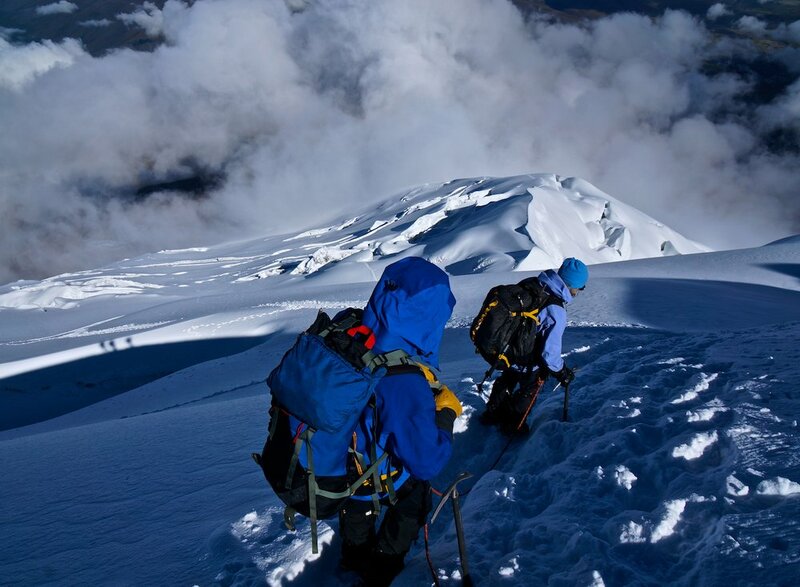 On the Climb of Chimborazo and Cayambe it is not required to have previous high altitude mountaineering experience. However, we do ask that you do have at least some basic experience using ice axe and crampons. You must be in very good physical shape. Arrive in Quito (9500 ft) and overnight at our modern 4-star hotel in the Mariscal Sucre district. We will explore Quito while acclimating, including a tour of the old city. Today we take a gondola ride up to Pichincha high above the city and climb Rucu Pinchincha (15,100 ft). Overnight again in Quito. We leave Quito in the morning and drive into the beautiful Cotopaxi National Park. The night is spent at the starkly beautiful Tambopaxi Lodge (12,300 ft) with spectacular views of Cotopaxi. We have a private room with private bath for our group. Today is an acclimating day in the Cotopaxi area. We will go for an acclimating hike up to about 16,000 ft.
A rest day at Tambopaxi preparing for our ascent of Cotopaxi, the highest active volcano in the world. Leaving around midnight , today is summit day on Cotopaxi. We will leave from our lodge at Tambopaxi where we can leave all of our extra things in our private room. After the climb we travel down to the resort town on Banos on the edge of the Amazon jungle. Banos is just below 6,000 ft which allows your body to fully recover before out next big high altitude objective. Rest day in Banos. The options are to explore the famous waterfalls in the Amazon Jungle just down river from Banos and soaking in the hot springs that Banos is famous for. Leaving Banos, it's back up to altitude. We drive through the city of Riobamba and then up to a beautiful country lodge, the Estrella de Chimborazo (13,000 ft) our basecamp for Chimborazo. The lodge has private hotel rooms and a cozy mountaineering themed main lodge and excellent restaurant. Acclimating day on Chimborazo with an acclimating hike up to the "Whimper Spires" at 17,000 ft. Overnight back at the lodge. Leaving the Estrella de Chimborazo, we travel up to the Carrel Refufge where we prepare for the evening's summit attempt on Chimborazo, Leaving just before midnight, the climb isa long day of steep snow and glacier climbing rewarded by standing on the top of the furthest point from the center of the earth. After our descent, we travel back to a luxurious hacienda resort in nearby Riobamba. Travel back to Quito for late afternoon or evening flights home.